LOS ANGELES — In recognition of its innovative use of recycled plastic, and its product design centered on recycling, the Institute of Scrap Recycling Industries (ISRI) names Nestlé Waters North America as its 2019 Design for Recycling (DFR) Award winner. The DFR Award is ISRI’s most prestigious award given annually to the most innovative contribution to products designed with recycling in mind. 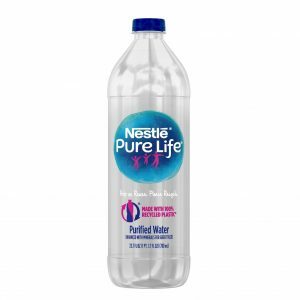 Nestlé Waters has received the award specifically for the design of its Nestlé Pure Life 700ml bottle made from 100 percent recycled PET plastic (rPET). In addition to the Nestlé Pure Life bottle being made entirely from recycled content, its design also takes into account end-of-life processing. For instance, the bottle features a state-of-the-art, pressure-sensitive label. Unlike traditional adhesive labels that may not release from the PET flakes during the recycling process, potentially damaging the recycling stream, these new labels will release easily during the wash stage of the recycling process so the material can be used to make new bottles again and again. Nestlé Waters North America has been incorporating recycled plastic into its packaging since 2011. In fact, since 2017, all single-serve bottles of the company’s Arrowhead® Brand Mountain Spring Water produced in California have been made using 50% recycled plastic. Most recently, the company also announced that it is on track to nearly quadruple its use of recycled PET plastic (rPET) in less than 3 years, with an ambition to reach 50% recycled plastic across its U.S. domestic portfolio by 2025.